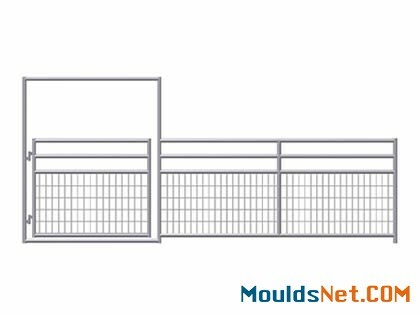 Except for the horse panels, you may need horse panel gate to be used combined with horse panels. As a professional manufacturer of horse panels, we can also supply you all kinds of horse panel gates for you. 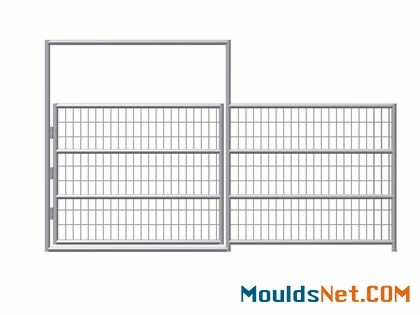 Different horse panel gates is used with different types of horse panel and can be used in different applications, just browse the horse panel gates and choose the perfect one suit for you. Welded wire horse panel is widely used in the feeding and rearing the new born cattle, horse or sheep. It has small openings to prevent the livestock from stepping our or squeezing their heads. The welded wire horse panel have different types, one type is welded horse panel with all-welded wire mesh and the other is that welded wire mesh is welded between the bottom rails and other space is empty. They can be used for different ages of livestock and for different applications. As a professional horse panel manufacturer, we can not only supply you the horse panel gates to be used combined with the horse panels. This type of horse panel gate is commonly used with welded wire horse panels. It is made of galvanized tubing, the tube is commonly round tube. The horse panel gate is composed of a round post frame and welded wire horse panel. The welded horse panel gate is commonly used for new born foals, sheep, cattle or other livestock. The all welded structure can ensure the firm and strong structure of the horse panel gate. Additional, the small opening of the welded wire mesh can prevent foals from squeezing their heads and stepping out of the panels. Material: low carbon steel tube. frame size: 1-7/8" × 16 G or 1-5/8" × 16 G.
Welded wire diameter: 6 G.
Welded wire mesh opening: 2" × 4". 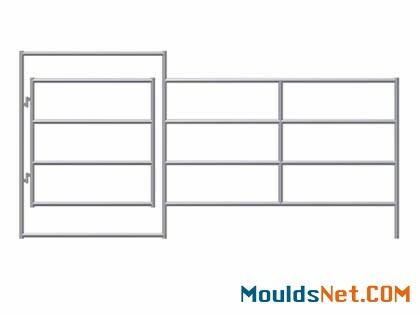 Wire panel width: 12', 16', and 24'. 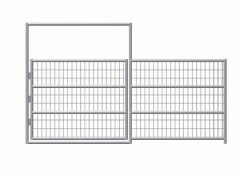 Gate size: 6' W × 7.5' H.
Rail quantity: 4, 5 or 6. 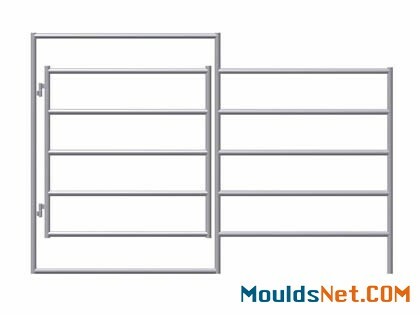 There is another type of horse panel gate for welded wire horse panel. 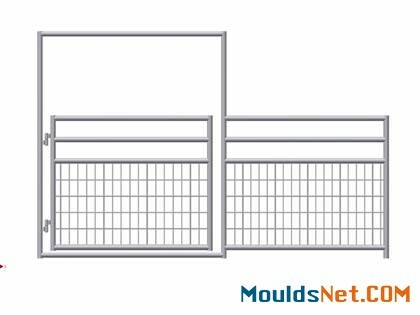 This type of welded wire gate is also composed of welded fence panel and door frame. It has 4 rails on the fence panel and the welded wire mesh is welded between the two bottom rails. The other space is empty. This type of welded fence is ideal for feeding the foaling. The bottom welded wire fence can prevent foaling from stepping out and the empty space is convenient for eating and drinking. 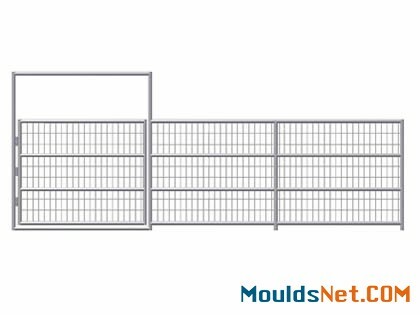 HPG-03: Bottom welded horse panel gate I.
HPG-04: Bottom welded horse panel gate II. frame size: 1-5/8" × 16 G or 1-7/8" × 16 G.
Welded wire mesh diameter: 6 G.
Welded wire mesh opening: 2 " × 4". Panel width: 12', 16', and 24'. Compared with the other types of horse panels, the portable corral panels has portable and removable features. It can be used for the horse, cattle, sheep or other livestock feeding. It can suit different applications and can be transported to anywher you need it. It is convenient to install and uninstall, it can save lots of installation time for you. We can supply the horse panel gate to suit the portable corral panels. In this way, you can get a complete pen for your livestock. HPG-05: Portable corral panel gate I.
HPG-06: Portable corral panel gate II. Pipe size: 1-5/8" × 16 G or 1-7/8" × 16 G.
Panel height: 5' or 6'. Panel width: 12', 16' and 24'. Rail quantity: 3, 4, 5 or 6.